"Flower bud" redirects here. For EP of GFriend, see Flower Bud (EP). For other uses, see Bud (disambiguation). 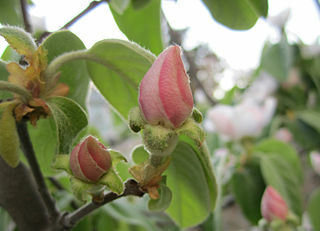 The buds of many woody plants, especially in temperate or cold climates, are protected by a covering of modified leaves called scales which tightly enclose the more delicate parts of the bud. Many bud scales are covered by a gummy substance which serves as added protection. When the bud develops, the scales may enlarge somewhat but usually just drop off, leaving a series of horizontally-elongated scars on the surface of the growing stem. By means of these scars one can determine the age of any young branch, since each year's growth ends in the formation of a bud, the formation of which produces an additional group of bud scale scars. Continued growth of the branch causes these scars to be obliterated after a few years so that the total age of older branches cannot be determined by this means. 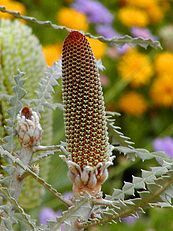 In many plants scales do not form over the bud, and the bud is then called a naked bud. The minute underdeveloped leaves in such buds are often excessively hairy. Naked buds are found in some shrubs, like some species of the Sumac and Viburnums (Viburnum alnifolium and V. lantana) and in herbaceous plants. In many of the latter, buds are even more reduced, often consisting of undifferentiated masses of cells in the axils of leaves. 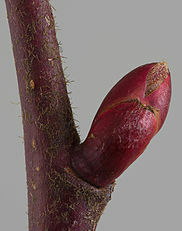 A terminal bud occurs on the end of a stem and lateral buds are found on the side. A head of cabbage (see Brassica) is an exceptionally large terminal bud, while Brussels sprouts are large lateral buds. Since buds are formed in the axils of leaves, their distribution on the stem is the same as that of leaves. There are alternate, opposite, and whorled buds, as well as the terminal bud at the tip of the stem. In many plants buds appear in unexpected places: these are known as adventitious buds. Often it is possible to find a bud in a remarkable series of gradations of bud scales. In the buckeye, for example, one may see a complete gradation from the small brown outer scale through larger scales which on unfolding become somewhat green to the inner scales of the bud, which are remarkably leaf-like. Such a series suggests that the scales of the bud are in truth leaves, modified to protect the more delicate parts of the plant during unfavorable periods. Buds are often useful in the identification of plants, especially for woody plants in winter when leaves have fallen. Buds may be classified and described according to different criteria: location, status, morphology, and function. adventitious, when occurring elsewhere, for example on trunk or on roots (some adventitious buds may be former axillary ones reduced and hidden under the bark, other adventitious buds are completely new formed ones). 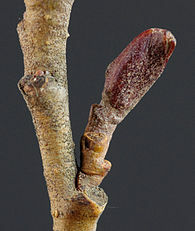 pseudoterminal, for an axillary bud taking over the function of a terminal bud (characteristic of species whose growth is sympodial: terminal bud dies and is replaced by the closer axillary bud, for examples beech, persimmon, Platanus have sympodial growth). hairy, when also protected by hairs (it may apply either to scaly or to naked buds). mixed, if containing both embryonic leaves and flowers. The term bud (as in budding) is used by analogy within zoology as well, where it refers to an outgrowth from the body which develops into a new individual. It is a form of asexual reproduction limited to animals or plants of relatively simple structure. In this process a portion of the wall of the parent cell softens and pushes out. The protuberance thus formed enlarges rapidly while at this time the nucleus of the parent cell divides (see: mitosis, meiosis). One of the resulting nuclei passes into the bud, and then the bud is cut off from its parent cell and the process is repeated. Often the daughter cell will begin to bud before it becomes separated from the parent, so that whole colonies of adhering cells may be formed. Eventually cross walls cut off the bud from the original cell. ^ Walters, Dirk R., and David J. Keil. 1996. Vascular plant taxonomy. Dubuque, Iowa: Kendall/Hunt Pub. Co. page 598. ^ Cronquist, Arthur, and Henry A. Gleason. 1991. Manual of Vascular Plants of Northeastern United States and Adjacent Canada. Bronx, New York: New York Botanical Garden Press. page 512.